Thread: Charvel with ebony board and odd pickup configurations. Was there ever an import MIJ Charvel that sported an ebony fret board with an unusual pickup configurations like single humbucker or slanted bridge pups or the like? I have this unusual desire for a white bodied, ebony board, single humbucker charvel with a reverse headstock. Pointed or strat style headstock is fine. 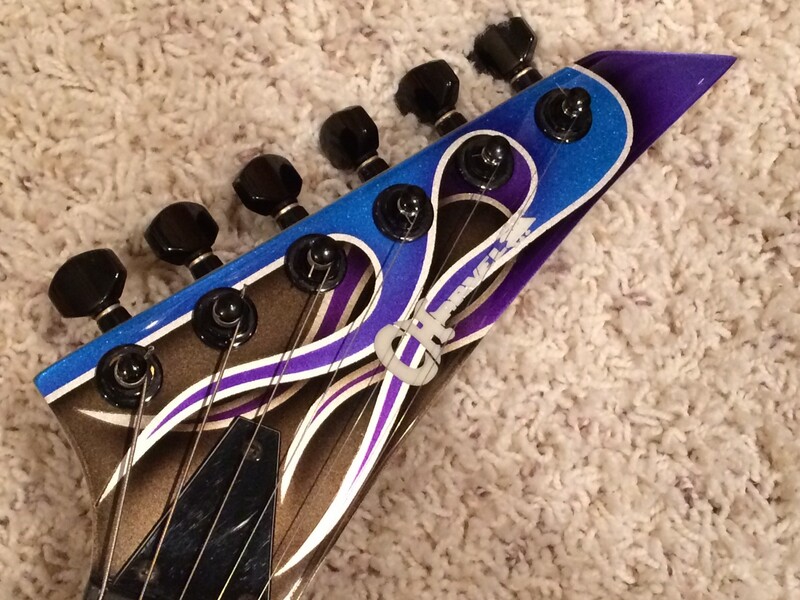 That said, I have a reverse pointy headstock neck which I slapped a toothpaste Charvel logo and it has ebony with dots. So I'm a single hum body away from what you are looking for LOL! Most (all?) MIJ Charvels came with rosewood. Can't think of one right now with ebony. Damn, that's really unfortunate honestly. Though I guess I could go the route you did if I can track down a single hum body or a slanted HS maybe? I think the 275 was like that right? Then grab a neck for it with ebony FB. Hot rod the hell out of it. The wheels are turning... Haha. I came across this ad a short while back and that's what got me thinking. If I could get that with ebony board and a reverse headstock I'd be in heaven Haha. White painted headstock with black charvel logo would be ideal. Last edited by Heavymetal2000; 04-12-2019 at 01:58 AM. The ebony requirement automatically eliminates many of the Japanese Jacksons and Charvels. And out of the surviving search results, the only ones that have reverse headstocks are two variants of the Jackson Doug Aldrich models, which are rare. http://audiozone.dk/index-filer/grov...ug-aldrich.htm But that's a Jackson, it's not single humbucker, and it's not white. If you want a Charvel, the Model 5A was a 1H variant of the Model 5. The Charvel Model 5FX was the same thing as a 5A but with a slanted neck single coil added. At least these came in white but they didn't have reverse headstocks or ebony fretboards. Like DonP, I also can't think of any Japanese Charvels that had ebony boards. Some recent Mexican import Charvels have ebony boards but you specified that you want Japanese. The Charvel 3DR has a reverse headstock and has a similar pickup layout as the Model 5FX, but again it doesn't have an ebony fretboard. CAD$525 is very high for that modded Charvel 275 Kijiji listing you posted. If you are unsatisfied with the single-locking tremolo, you will have to invest more money in a double-locking trem on top of the $525. Though I must admit, the guitar looks to be in great shape and the bridge pickup routing looks cleanly done from what I can see in the photos, though I'd want to look more closely at it in person, and lift up the bridge pickup to inspect the route and how well it was done. EDIT: Hmmm looks like the owner of the Charvel 275 installed a trem stopper in the trem cavity, which might reduce or completely eliminate any tuning issues with that single-locking trem, especially if he never uses the trem and treats the guitar like a fixed bridge guitar. Last edited by Number Of The Priest; 04-12-2019 at 07:41 AM. Yeh I found the price pretty high myself so I never inquired for purchasing. I just happened to like the look and it got me wondering if the particular charvel I was envisioning existed. I quite like the look of the reverse fender headstock surprisingly. But it looks like I'm SOL unless I go with a non mij or opt for a custom which is not something I'm willing to do at this point as I'm still in the early stages of playing and cant justify the investment of a custom guitar. Thanks for digging around for me, I really appreciate it. Like NOP said, an ebony board is not a typical spec on import Charvels. But the newer Model 88 has an ebony board, shark fins and a reverse pointy headstock. You could always find a used one and then have the body modified to fill in the neck pickup and repainted white. GMW does a lot of that work and it would be a lot cheaper, and quicker, than having a custom Charvel made. Another option is to find a used model 2 and have the fingerboard replaced with an ebony board. The strat sized body is already a single hum and you could get that repainted white. So there are options out there, just have to be a little creative to get the specs you want with it and stay within your budget. Most times it's easier to find a guitar that has some of the basic specs you're looking for and then have it customized. There are shops like GMW, DRL, Marty Bell, Mike Learn, etc that do great work. And not to sound like a sales rep for GMW, but Lee can also relogo authentic Charvel and Jackson necks if you are repainting the headstock. I've had most of my work done by GMW and I'm very happy with the quality and service. 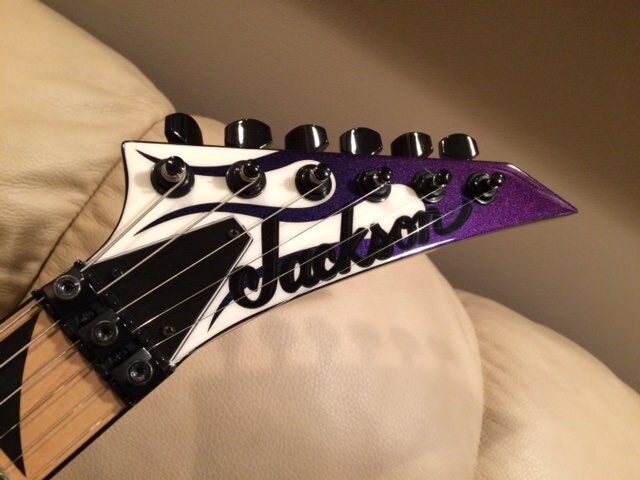 Here's a couple pics of a Charvel and Jackson headstock that was repainted and relogoed just to give you an idea. There are various Made in Japan "Jacksons" and also the ones branded "Grover Jackson" from the 1990-1996 time frame that have those specifications. Many of those were manufactured at the same place in Japan as the Model Series Charvels. I just saw a Doug Aldrich Jackson for sale somewhere like Ebay or Reverb that had a ebony board. Those headstocks look slick, very nice work for sure! Single hum would be nice as I really like the look but I'd be cool with 1 hum 1 single. Just something away from the normal hh/hss/sss. I'm in Canada, so I'm not sure where these places are but if they're in the US, there is no way I could justify shipping and custom work unfortunately. I could ask the guy I see here when I need information and work done that I can't do at home and see if he'd be up to doing the fret board swap. I could in theory sand and do the paint myself as I'm looking for just a straight white body. Matte white maybe... hmmm. And I'd be interested in doing some work myself to learn and save money. What site is best if I would like to browse the import charvel models? Yeh I've seen more then a few jacksons with ebony but I already have 2 atm. My Ibanez strat body is on the way out as I dont particularly enjoy anything about it and never play it. Figured I'd go for a charvel strat as I find you dont see them as often as the dinky/soloist from Jackson and I'd just really like to have at least 1 charvel to jam with. I always forget about the Charvel Predator, which seems to be the toothpaste logo era version of the 3DR. At the moment, I'm not sure there's a Charvel equivalent of https://guitarinside.com/. Last edited by Number Of The Priest; 04-18-2019 at 07:05 AM. Iys too bad, cause guitarinside is such a sweet resource for Jackson! I've been keeping my eyes peeled for a used charvel though. I'd almost rather something beat up so it's worth modding as opposed to paying decent money for a nice one then messing around with it. Might even be nice to find it in pieces if the price was right. Definitely been using audiozone quite a bit lately for references.